Self recognition, a building block of nature, is observed in immune defenses and group behaviors such as territoriality. In my research group, we directly examine the molecular mechanisms for self recognition in the context of a genetically tractable model system, the bacterium Proteus mirabilis. For P. mirabilis, self versus non-self recognition is exhibited through the physical exclusion of one strain from nutrient-provided surfaces occupied by another, which is naturally visualized as the formation of a macroscopically visible boundary between the two approaching populations. My colleagues and I have elucidated the minimal self-recognition genes and the encoded proteins in strain BB2000 and are characterizing their regulation, interactions, and functions. 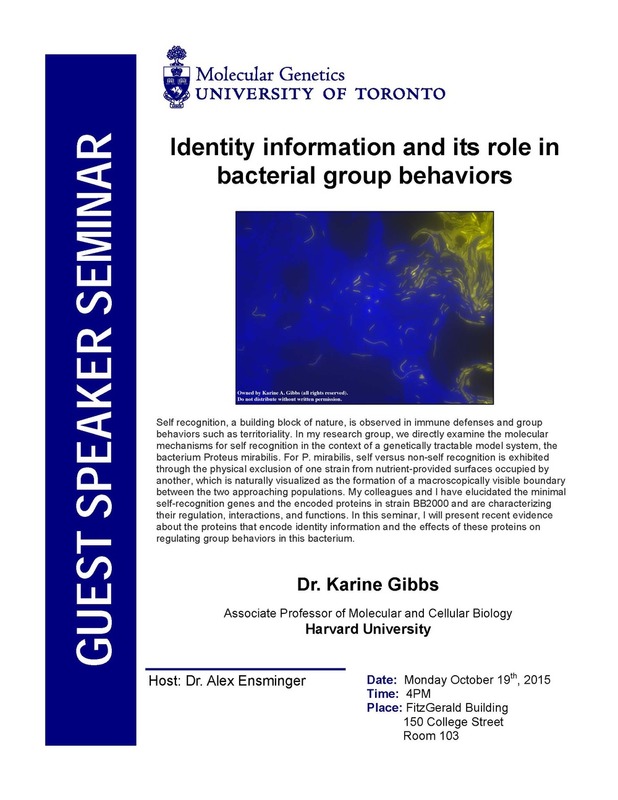 In this seminar, I will present recent evidence about the proteins that encode identity information and the effects of these proteins on regulating group behaviors in this bacterium.